Once the capital of the region, Salò’s historic town centre is lined with Liberty-style villas and a few fine examples of older palazzi. There is a grand Gothic duomo and some wonderful civic buildings in the Renaissance style. And then of course there are those exquisite views of Lake Garda. As far as our Gurus are concerned, the best places to stay in Salò are those with the finest lake views. Their list also includes some lovely converted properties higher up the hill, towards the Monte San Bartolomeo, which were once elegant homes and villas. Visit Salò's fantastic Duomo with its gothic facade and fascinating interior. Also the super Palazzo della Magnifica Patria. The palace is home to the Historical Museum of the Azure Ribbon an exhibition of documents of Renaissance history, Italy's colonial wars, the Spanish Civil War and the Resistance against Fascism. The wonderful position on Lake Garda is one of the prime reasons for coming to Salò. 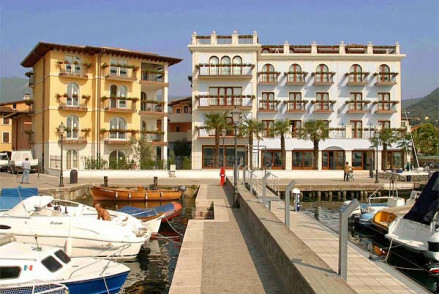 Lake Garda is a hotspot for holiday makers in the summer, so if your wish to book into one the Hotel Guru's selection of the best places to stay in Salò, we recommend you book well in advance. 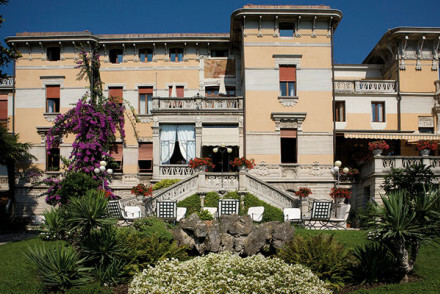 The Villa Arcadio is a wonderful stone villa converted into an 18 room hotel located on the slopes above the lake. The bedrooms, and one suite, offer remarkable views of the lake and are decorated simply with bare stone walls and just glimpses of frescoes. There’s a fantastic gourmet-yet-traditional restaurant, a lovely terrace, pool and gardens. 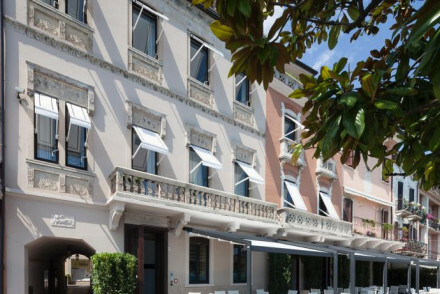 The Hotel Laurin is a stunning hotel with 30 rooms and suites right on the shores of Lake Garda that has been onverted from an elegant 20th Century villa, Guests can expect parquet floors, frescoes and Art Nouveau furniture. There’s also a lovely pool in shady gardens and an excellent restaurant. Right on the shore of Lake Garda, the Hotel Bellerive is a charming mid-sized hotel with 46 large, stylish rooms plus an outdoor pool and fantastic Italian concept restaurant. Sailing and golfing opportunities are nearby. Hotel Locanda del Benaco combines stylish design features with a superb lakeside setting. Chic rooms, luxurious bathrooms and an excellent restaurant all make for an exemplary hotel in Salò. Salò is best served by either Bergamo or Verona airport. Hiring a car is a great way to explore Salò and the surrounding lake, so visit our online partner Rentalcars. The best time to visit Salò and Lake Garda is in the summer months (May to September, when temperatures range from 22ºC to 28ºC. Still not sure which is the best place to stay in Salò for you? Browse through our list of all the best places to stay in Salò.